31 for 21 Blog Challenge! Well, this is the first time I have done this. 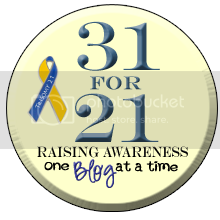 I just joined the 4th Annual 31 for 21 Blog Challenge to raise awareness about Down Syndrome! Which means, I've got to do a blog post a day for the whole month of October. As most of you probably know, I have a great little brother who has Down Syndrome. His name is Osiyyah, he is 5 years old and I know that life without him would be pretty dull! He is just such a blessing. October is Down Syndrome Awareness month, in case you didn't know ;). 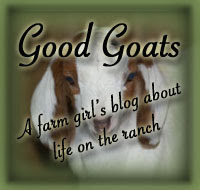 If you have any suggestions, things you'd like me to blog about, please leave me a comment - it'll be welcomed! Mark your calendar and come with us to the annual 2010 Down Syndrome Association of Tulsa Buddy Walk! Come to the track at Union High School in Tulsa, on Sunday, October 17th between 1:30 and 4pm. We'll be there (with some farm animals! ), Lord willing! A few random photos from this week. . .
Have a good night and hopefully we'll see you in Tulsa on October 17th! Well, hello all! My Grandma has been here for the past week and we've had a great time. My sister's 20th birthday was a few days ago, we went out to eat a few times and then on Monday we rented the roller skating rink out - that was a blast! Everyone has been doing pretty well. Yesterday morning Whitney, one of our Min Nubian does, wasn't doing so great. She's had lots of trouble (with snot, pneumonia, etc) since we moved here to Oklahoma, and I've treated her with lots of things but most the time it doesn't really work well. Well, yesterday we finally lost her :(. Seems like all of my posts have had something "sad" in them these past few times, but it's been a rough year! In a way, we all expected to loose her, but as always, very sad :(. ANYWAY, hopefully my posts will be better from now on ;). On the bright side of things, everything has really been going great. Today we moved Buddy, the alpaca, out of his stall into a small yard with our 7 doe kids and their guardian pup. Buddy is WAY better than he used to be, I can actually get a halter on him now with no troubles, but he still has a ways to go. They all weren't so sure of each other at first, but they are all doing good together now. Since I had the camera out there, I had to snap a few photos :). This is Snickers. On another note, several days ago I made a batch of the mild Feta cheese. This stuff is yummy! There are still lots of peppers coming from the garden! There are also still pumpkins, watermelons, cataloupe, sweet potatoes, and zuccini growing (and I'm probably forgetting something!). Well, I think that's it for now. Today's the first day of Fall too - yay! We did it again. . . got a couple more goats! Yesterday we picked up Athena and Helena. They are Snubian does (Nubian/Saanen). They are both very big and strong does. Thank you to Lexy of Rushtawin Nubians for these girls! Here are a few pictures of them - these photos were taken right before we loaded them up to come home. This is Goldthwaite Athena II. She is probably bred and due in 1 to 1 1/2 months. This is Goldthwaite Helena II. She is currently milking. Yesterday we picked my Grandma up at the airport, all the way from California! I may not be blogging as much as we'll be busy with normal life and doing other things - going places, renting a skating rink for my sister's b-day, etc..
As a quick update - the Boer doe that I posted about last time who had pneumonia - we lost her on Sunday :(. Upon necropsy it looked like about 70% of her lungs were infected and there was something wrong with her neck, possibly listeriosis. Anyway, sad to have lost her, she was actually getting way better and put up a good fight :(. Everyone else is doing *wonderful*. Very thankful for that. If anyone is looking for HAY - we have some! Just got another load in. It smells great! What do I have to update on? Life has been pretty normal, except this weather caused some sickness the past few days. It was pretty nice and not-too-hot here for a while, then on Wednesday we got a lot of rain (from the hurricane), and then it got hot and really humid yesterday. You know what that means? Prime weather for pneumonia. 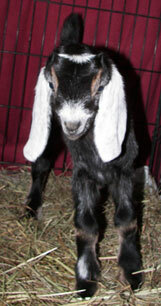 Well, Whitney, one of my Mini Nubian does, had a big rattle in her chest yesterday. I just started to worm her also since she seemed to need it, and for some reason hasn't been as thrifty as everyone else - most of the rest of the herd are doing great, sassy and healthy! She was still eating, but not extremely well. I promptly gave her a bunch of vitamins, Banamine, started her on Naxcel and did not let her go out to pasture. Last night and this morning she is better, but still has a small rattle in her chest. Most Friday nights are quite crazy around here, trying to milk/etc. before going places. 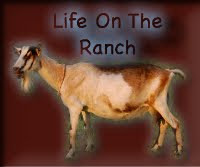 My brother Todahyah came in and said that one of the Boer does did not look well, looked like she had a cold/pneumonia. I gave him some vitamins to go give her and was when I was done milking I'd give her the shot of Naxcel. Well, by the time I was done milking - only 30 minutes later - she was laying down, weak, and was having a hard time breathing. I thought she was dying. I gave her the shot and hoped for the best, we had to leave. When we got home, she was still there. This morning we decided to tube her some electrolytes, which she did pretty good with. We made her comfortable with a big bed of hay in the shade with her daughter by her (who didn't want to leave her), and we're praying for the best. My cousin who tubed her thinks she'll make it, I'm not so sure. 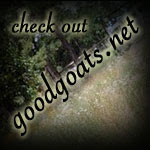 So, I guess this post is a warning to all you with goats (and any other animals) out there, watch your animals VERY close in this weather. It is more common for animals to get pneumonia in the summer, at least here in humid Oklahoma, than in the winter. They can come down super fast. This Boer doe was normal yesterday morning, 7 hours later she was almost dying. Off my little soapbox now. . .
Last night my little sister got a little lamb that she is hoping to friendly up and teach to lead. I put Cutie in with her, and she (the lamb) didn't like Cutie at all, she was stomping her feet and all. Pretty funny. Yesterday we got another load of hay delivered. It is SO nice and, in my cousin's words, "smells so good I almost want to eat it" :)! We feed our llama, Salty, on the edge of the trailer as it is just tall enough where she can eat it without the goats pestering her too much. My little sister, Hanunyah, snapped some photos of the goats, sheep and llama going out to pasture this morning. The sheep come out and go one way, the goats and the llama go the other way. Well, I think that's it for now. Saturday is another busy day, so I guess I gotta go get cleaned up. I really needed some updated pictures of our sweet little kid, Cutie. She is getting big, and her colors have really come out. Her brown spots are actually white underneath - so if she ever gets a shave job (not this year, too cold! ), I think she'll have white spots instead of brown spots - interesting! Anyway, she is just the sweetest little thing and is doing so good with training. She comes when called now (at least when I call her) and is walking on a lead pretty well. Have a good day. . . I think we'll spend our afternoon swimming, and who knows what else. It's really been a week since I last blogged?!? Doesn't seem like it! Last night we got a good amount of rain - yay! We've been needing rain for a while now, everything was getting pretty brown and dry. To recap the past week. . .
We had a "family talk" and decided to get rid of the pond for now. It was either do a lot of work to it and make it much cleaner and better, or drain it for now. We could always plug the hole back up and have a pond again. It was pretty shallow anyway and gross. The only reason we could think of keeping it for would be, ice skating in the winter I guess. Not a very good reason in my opinion ;). The reasons for getting rid of it where - it was a threat to some of our animals. We lost a llama a year and a half ago to Meningeal Worm (deer worm), which is primarily from ponds and swampy areas. Then we had some pigs out to pasture, and one of them got sick from algae poisoning. We treated her and she got better, thankfully. So anyway, since there were no good reasons to keep it and a few reasons to get rid of it, we decided to drain it for now. On another topic, in my last post I talked about our brown llama, Peppercorn, who was sick. Well, a day later she passed away right in front of us. Very sad :(. Upon necropsy we found out that she was indeed pregnant, but not due for at least another month (makes it even worse, huh). Her heart did not look good and neither did her intestines. Oh well. The Lord gives and takes away, blessed be His name. You know, we originally got the llamas to guard our goats. When we had both of them, Peppercorn and Salty, they would hang out in the pasture but would not stay with the goats - so, not very good guardians I guess. Well, ever since we lost Peppercorn, Salty has been hanging out with the goats WAY more. She now comes back when they come back for water, she comes back when it's time to milk. So it has actually turned out really well. Praise the Lord! I really think that Salty is pregnant though, her belly just seems to be getting bigger and bigger. We are extra pampering her now though, too :). It has not been as hot as it was for a while, some days are hot, others aren't as bad. This morning though it was "cold" - 61 degrees! So nice! All the animals liked it I think and they all have felt a bit frisky on the cooler days. Here's Wonder, the other day, trying to figure out how she could reach those leaves. She eventually did figure it out ;). If anyone is looking for pot bellied pigs, we have some for sale! I think they're cute ;).